How far does Agility go? 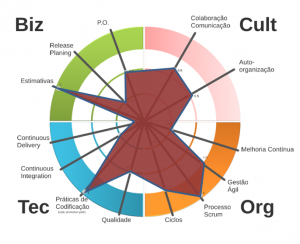 It is usually difficult to map the border between what is agile and what isn’t. Making this border clear is important to answer various questions: How much progress is an organization making regarding Agility? What are the points that team needs to improve? 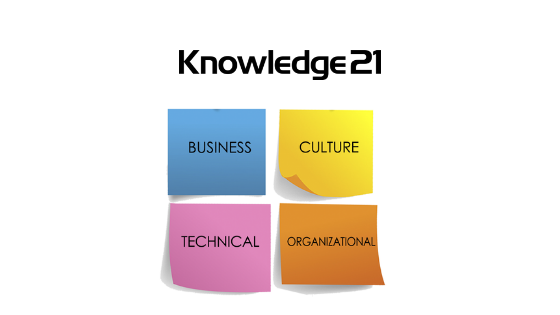 What is the next knowledge an individual should acquire on Agile methods? In the past few years, Agility has proven to be much more than a model for teams working on software projects. Agile methods can influence everything from the way a development code is created to the whole operation of a company. There are more and more examples of applications of these methods cascading through the entire productive chain and even in companies outside IT. 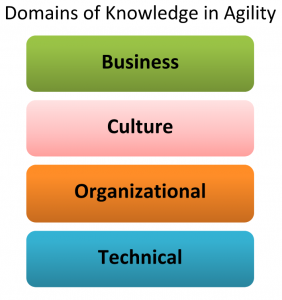 We propose here a map of the Agility domains, in order to classify knowledge around this topic. In the Business domain, there are topics related to the company’s products and objectives: Return on Investment computations for the product and its upcoming functionalities, prioritization, planning of upcoming releases, and perhaps contracts in the Agile context. Most of the knowledge the Product Owner must have is in this domain. In the Cultural domain, the focus is on human relations. 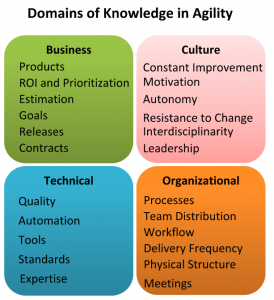 In this domain are two extremely important topics for Agility: breaking paradigms and continuous improvement. Besides these points, we can highlight self-organization and motivation of individuals and teams. The Organizational domain is more related to teamwork: the methods the team uses, the development cycle, the iterative process, and how people are distributed across teams. In the Technical domain, attention is given to how the work is carried out by the team. Automation is an essential piece of knowledge in this domain, as it impacts the other technical topics: quality, standards, tools, etc. In IT, the best software engineering practices brought by the XP are in the technical domain. How to use the 4 domains? For someone who is learning about Agile methods or someone who wants to know more about them and can use the domains as a guide for the next steps. 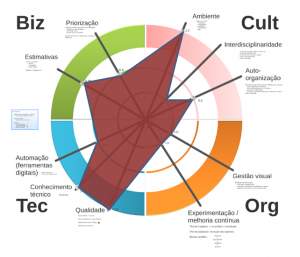 It can be used to map the performance of a team or organization. In the industry, we call this assessment, which is an evaluation compared to the state-of-the-art in each domain. The figure below shows two examples of assessment applied to different companies to map their Agility level. The first observation we can make is that, while one of the companies needs to exercise more care in the organizational domain, the other should pay more attention to the business domain. An essential feature of this assessment method is the flexibility of the items to be taken into account. Note that assessing all items of each domain isn’t required – i.e., depending on the team or company, different topics can be evaluated. For each topic, we bring up positive aspects as well as points that require attention, to discuss them in more detail. This graph can be updated from time to time, and the difference between the versions will show the team’s progress (or regression) in each of the domains. At K21, we apply this type of assessment both for new clients and for those that have already adopted Agile methods and want to map their new steps. « Controversy: Can the Product Owner participate in the Retrospective?